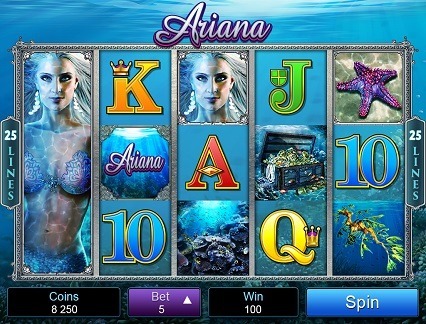 Game Information: Ariana is a colourful and charming mermaid/underwater kingdom-themed slot from Microgaming’s Quickfire brand featuring 5 reels and 25 paylines. The game was released in 2015 and has fast-become one of the favourites at our recommended Microgaming casinos. Arian is a medium volatility slot and offers a solid pay-out percentage of around 96% and, with its fun theme and easy gameplay, the game is ideal for both beginner slots players and more experienced gamers. 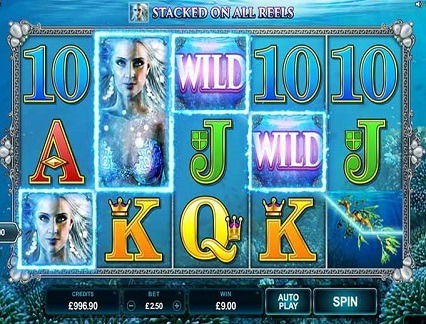 Lovers of Disney classics such as The Little Mermaid will love this slot, as will fans of fun slots with regular payouts. Ariana’s graphics and layout are both visually appealing and game symbols include the standard playing card symbols as well as theme-specific symbols including a variety of sea creatures including a starfish and a seahorse and the proverbial treasure chest. Of course Ariana, the beautiful mermaid princess is ever-present, encouraging and guiding you as you explore her underwater kingdom. The game offers flexible coin and bet sizes, making it very accessible for all levels of bankrolls. Starfish Scatter Symbol: When the Starfish Scatter symbol appears three times across all 5 reels in the base game of Ariana you will automatically trigger the Free Spins round which is the only special game feature in this title. The Free Spins round will give you an initial 15 Free Spins to play with, with the possibility of getting more Starfish Scatters during the round which could retrigger the Free Spins bonus. The Wild Symbol: The games Wild Symbol (Ariana Logo) can replace other game symbols with the exception of the Scatter symbol to make winning combinations easier and more frequent. The Expanding Symbol: This is possibly the game’s most interesting and exciting special feature. The game’s first reel is home to the Expanding symbol (Ariana) which, when triggered, will occupy the entire reel. The trick here is to get matching expandable symbols on the other reels in a winning combination, if this happens then all the reels will expand, making your prize much more substantial and also easier to get! During the base game, the Expanding symbol counts for every other symbol other than the Wild and the playing card symbols. During the games Free Spins round however, the Expanding symbol the Wild symbol also counts which really makes for some exciting winning opportunities! The graphics in Ariana are breath-taking and dazzling at the same time with gorgeous aquamarine colours and the shimmer of light penetrating the submarine world of the mermaid princess. The graphics are more realistic and less cartoon-like which should appeal to more fans of classic mermaid tales. The graphics and sound really start to come to life whenever you win a prize as a happy tune starts to play to the accompaniment of animated symbols within colourful borders. Curiously however, the sound in general is not theme-related and is representative of a busy casino lobby, something that could actually be somewhat distracting. The overall layout is nice and clear and features a highlighted winning payline (when you win on it) and wining amounts per spin neatly displayed to the left of the screen, leaving the beautiful graphics free to be enjoyed during the game. Ariana is not a progressive jackpot pokie and the main prize that players can win is a not too bad up to 200x your bet. The game is considered to be a medium volatility game which pays out fairly frequently albeit in a somewhat lower amount than other (progressive/higher volatility) games might do. Ariana’s biggest attractions in terms of special features is the Free Spins bonus game which has the added attraction of being re-triggered when more scatter symbols appear, this can add up to serious totals as each successive re-trigger brings more possibilities of Free Spins with Wilds and Expanding Wilds. The Expanding Wild symbol can also cover all 5 reels for a serious pay-out opportunity with just a single spin!